Hello, and welcome to our recommended list of cereal-related books and publications. Since many of these publications are out of print and may be difficult to find in your local library, we provide links to Amazon Bookstore's inventory of books on cereal, and contact information on the other publications. 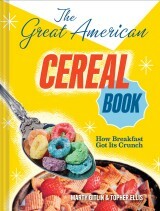 "The Great American Cereal Book" is a full color 368-page hardcover tome of breakfast cereal. 350 images of cereal boxes, advertisements and premiums from 1863 to 2010 are gloriously presented along with historical information (complete with dates, ingredients, slogans, spokescharacters, and interesting facts) on almost 400 cereals, with references to hundreds more. Printed on high quality paper and strategically priced under $20, this massive (a whopping 1.5 inches thick and weighing in at almost 2.25 pounds) encyclopedia of cereal is available at your favorite bookstore or specialty retailer. Tim explores the history and evolution of cereal characters in an effort to both celebrate and measure their impact on American culture, focusing primarily on the years 1950–1979, when children’s programming became a powerful force and savvy advertisers realized that they could directly appeal to an enormous audience of kids through this new medium. In many ways these cereal commercials became extensions of the regularly scheduled programming featuring their own cast of animated characters. 240 pages. A cereal history with information on the characters, both real and animated, that have popularized cereal in the United States. Also has lots of insight on character marketing and advertising. 312 pages. (Out of print. New and used copies are often available for sale). Price Guide on premiums from olde time television and radio programs, as well as comic book premiums and cereal prizes. 176 pages. This price guide provides information, prices, and pictures of toys, posters, books, and other memorabilia from the 1800's through the early 2000's. Huge 1,168-page book with over 15,000 photographs and more than 45,000 prices. (Out of print. New and used copies are often available for sale). Character Toys including premiums, comic, cereal, TV, radio and related store bought items. Over 856 pages filled	with over 39,000 priced entries in over 360 categories and loaded with 13,000	pictures. 4th Edition. (Out of print. New and used editions are often available). Also try the 5th Edition which has 14,000 items on 928 pages. (Out of print. New and used editions are often available). The Breakfast Cereal Gourmet celebrates cereal, serving up over 30 original recipes that utilize the likes of Kix, Trix, Froot Loops, Frosted Flakes, Chex, and Cheerios as a primary ingredient. The 128 full-color pages are filled with images of vintage packaging and original advertising, mixed with little-known cereal facts, figures, anecdotes, and history. 192 full-color pages filled with interesting images of cereal boxes, ice creams, sodas, candy wrappers, snacks and other odd foods marketed to kids over the past seven decades. 220 pages full of pictures and	information on cereal boxes and cereal premiums from the 1950's. (Out of print. Used copies are often available for sale). 246 pages filled with pictures and information on cereal boxes and cereal premiums from the 1960's. (Out of print. Used copies are often available for sale). I have a very limited number of new near-mint condition copies available for $30 each (includes shipping via Priority Mail with a delivery confirmation). Let me know if you are interested. "This 60 minute tape looks at 'Soggy Celebrities,' with over 70 commercials that find your favorite breakfast cereals being hawked by everyone from Superman and the Lone Ranger to The Monkees and Danny Thomas. Bet you cannot recognize everybody who appears in these black and white, and color, commercials stretching back to the dawn of television." [Excerpt from Amazon.com review]. Good news! Robb Berry official announced in Planet-Q! magazine that he is working on a full color book featuring cereal boxes of the 1970's. Publication is expected in late 2012. We have received a number of inquiries looking for books featuring cereal boxes of the 1980's. This book does not yet exist. you can find out here! Note: This publication is a newsletter and it is not available through Amazon Bookstore. The Boxtop: "Crunchy Nuggets for the Cerealist"
The Boxtop is a seasonal cereal newsletter published exclusively on the internet. Content includes character information, cereal reviews, "what's new in cereal" and cereal-related feature articles. Free! Note: This magazine is not available through Amazon Bookstore. Information and images of cereal boxes and cereal premiums, as well as interviews and other great content. The first issue came out in Spring 2004. Back issues may be available for $9.95 each. Order issues for $5.95 (plus $2.05 shipping) from: Robb Z. Berry, 420 N. 39th Ave, W., Duluth, MN 55807. He also accepts Paypal. Contact him via his website. Note: This book is not available through Amazon Bookstore. "This Complete Breakfast of the Gods"
Wow! Brendan Douglas Jones has completed his edgy "Breakfast of the Gods" trilogy and published his work in a beautiful 140-page full color edition. His graphic novel is equal parts humor and dark violence (and intended for an adult audience). It's a mystery adventure involving the battle of good versus evil in the land of Cerealia. Brendan's attention to detail can be enjoyed in each exciting and exquisitely crafted panel, from the cloud silhouettes which grace the chapter covers to the classic comic book treatment of a world populated by breakfast cereal characters. You'll enjoy seeing his development of primary characters such as Cap'n Crunch, Tony the Tiger, Trix Rabbit (and a few surprises), along with a supporting cast featuring dozens of breakfast icons breaking loose from 60 years of cereal boxes to fill his pages. You can tell a lot of research went into his effort as verbal and visual in-jokes and references abound. This is a page turner from start to finish that I guarantee will keep you filling your cereal bowl. A	wealth of information on the popular Jay Ward Studios cereal characters including Quisp, Quake, Cap'n Crunch, and King Vitaman, can be found in the 24-page September 1993 special double issue of "The Frostbite Falls Far-Flung Flier". Order issue 7.4/8.1 (9/93) for $5 (postpaid) from: Gary David, P.O. Box 39, Macedonia, OH 44056-0039. (Out of print). Note: This publication is in booklet form and it is not available through Amazon Bookstore. Written, Drawn, and Published by Ben T. Steckler. Issue #1 / Fall 1999 features a hilariously nostalgic romp to "The Island of Lost Bowls". This parody features dozens of "forgotten"	cereal characters who all hope that some day they'll be featured once again on cereal boxes. A fun and educational read. See if you can spot your favorite character from your youth! Recommended for adults as some content may be inappropriate for younger family members. Order issue #1 (Fall '99) for $2.50 (postpaid) from: Ben T. Steckler, POB 7273, York, PA 17404. Check Out Topher's Castle - A Great Site For Everyone! Amazon.com is pleased to have Topher's Castle in the family of Amazon.com Associates. We've agreed to ship books and provide customer service for orders we receive through special links at Topher's	Breakfast Cereal Character Guide. Amazon.com Associates list selected books in an editorial context that helps you choose the right books. We encourage you to visit Topher's Breakfast Cereal Character Guide often to see what new books they've selected for you. Thank you for shopping with an	Amazon.com Associate.